This is something that occurred to me while walking yesterday and watching a couple of cats stalk a bird. It’s probably been done in games before but I can’t remember seeing it – that’s one of the problems of not playing other games. The idea is that when you press the backwards key somewhere on the screen a small window appears that shows the view behind you. The size, placement and transparency of the view would be controlled by the player in an options window, same as other in-game options. The faster you move backwards the more solid the view is. I suppose there must be variations, such as when we turn the mouse a small area of the edge of the screen increases the field of view or something like that. I know the cats couldn’t look backwards but any sound behind them caused their ears to turn and of course we can do that. It got me think about being more aware of our surroundings while playing games. I know that when we get hit from behind the red signal appears at the bottom of the screen but I am thinking more about seeing rather than responding. I have created a simple mock-up here: A Looking Backwards Example. I am interested to hear from readers if they have seen the idea in other games and if they have did they like it. Also, what do you think of the general concept? other than racing games, I cant think of other examples. Perhaps one of the Mech Warrior themed titles would have directional cameras and such that display on the hud. But in SP FPS, I don’t think a rear view mirror is a necessity. 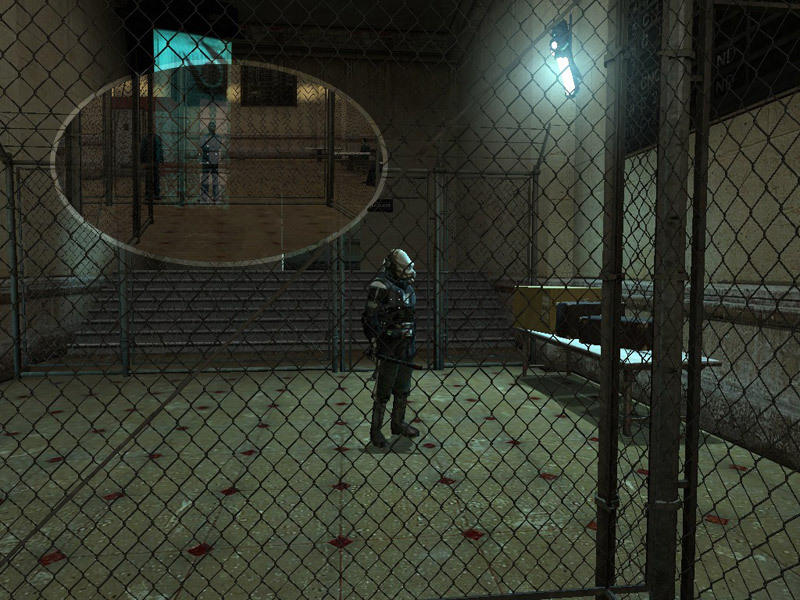 Perhaps if the player had to get into a heavy suit that would preclude his ability to turn his head…like Dead Space. That guy had a heavy suit and it was tough to turn around to check your six. Having a small rear view camera attached to the helmet would have been a nice addition. I agree it’s not necessary but since we have the zoom feature in the HEV it might not be completely out of place. In a heavy firefight it might be nice to still control where youa re moving and keep firing. What benefits could seeing behind yourself only when you walk backwards have? Unless your engaging a large amount of enemies while running backwards over a very thin bridge. Reminds me of a program I watched about a guy who had a chip planted into his head so he could use a sonar device to see behind himself. They put him in the dark and asked him to identify the shapes behind him. It was pretty sweet! Surroundings hold so much we cant see. Smells, temperature, weight etc if you give the player the ability to “see” these things. You have a whole new range of game play possibilities. More awareness of your surroundings. Of course an idea like this might be more useful in MP games, where you really need to be aware of what is happening around you more than SP, which tend to be in front of you. Exactly. And it’s an area I have written about before; here, here and here. Don’t get me wrong, I like the idea of seeing behind yourself but if only occurs when you walk backwards it would mean you would have to anticipate something in order to walk backwards and see. Maybe be a proximity parking sensor. I’m sure that would work in a nice horror mod, invisible enemies moving in on you. Your proximity sensor getting more and more erratic. Wow, you have mentioned it a few times. About bloody time someone put it in a mod then! Ive been trying to think of a unique element to slot into an area of my mod. Maybe I shall give this a whirl. I’ve been trying to think of a unique element to slot into an area of my mod. Actually I was thinking in terms of a visual game-play element. Like you were saying in the article. Not sure I would like to see backwards as it would distract me. I would prefer auditory over ocular and hear the sneaky SOBs creeping up on me. Very many times you get attacked from out of vision while squeaking along in your HEV suit without even so much as hearing a door opening or closing. It’s not so much about enemies sneaking up behind you, just being able to face forwards and move backwards, perhaps to backtrack and getting ambushed. Actually, that’s not a bad idea but with a variation. You sometimes need to backtrack but lose sight of what was forwards and where danger still lurks and wants to attack you. On a turn back, for whatever reason, a view back to what was forwards. Sometimes, the combat dictates that you need to do a runner, eg to get back to an ammo box or place of refuge or just to draw the enemy out, but you have no idea if the enemy are chasing you, where they are or how close. Needs a dedicated keybinding rather than happening automatically. I’ve always felt that there should be far more visual representation of a humans extended senses in FPS mods. Particularly peripheral vision. Essentially making it so that there is a tightly distorted border to the outside 5-10% or so of the screen that would give you a view of your characters peripheral vision. However the distortion would make it so that anything in that range would almost be unidentifiable, but it would allow you to pick up movement which is essentially the same as what peripheral vision does in real life. Before I ran into the half life series, I preferred 3rd person games over first person shooters, and this was due to my belief that the limited view that the camera allowed of the immediate area around you essentially acted to visually simulate a persons extended senses. We can feel things like touch, noise, air pressure changes and changes in light and shadows near us to notice events that are taking place behind us, but the range of that isn’t infinite. It usually coincides pretty closely with the visual range that you get from 3rd person perspective games. I’m not sure I like the idea of having a screen, even secondary, that points backwards though. It’s an interesting thought, but it has no real life equivalent, unless you’re in a car. I’m highly in favor of any additional information designed around extending the senses of a character that is limited to the effective tunnel vision that a FPS provides, but I’m not nearly as interested in just adding additional information that has no real life connection. As players of FPS games we have no necks. We cannot quickly look over our shoulders, so to speak, for a quick glimpse behind us without turning. We can look/walk/run in one direction while quickly looking over our shoulders to see if anything is chasing, where it is and whether it needs dealing with now. We can also check whether things have changed in an area we have already been through and if we need to do anything. For as long as you keep the key depressed, you are looking over your shoulder. I think the “glimpse” should be full screen rather than a small window because it would be closer to ‘real life’. I remember back in the day that games like Rise of the Triad had something like that, you hit one key and did an instant 180. Haven’t seen that in a game in years. This would save my life so many times in TF2. I back off from an enemy, and I’m going beside the wall, when I hit some tiny obstacle like a pipe sticking out and I stop moving. The guy catches up and kills me before I notice what’s going on. Or when I just back into a wall I forgot was there. Now that’s annoying, I’d like a rear view mirror a whole lot! I was thinking the same: I’m trying to back up to a safe place, and I get stuck on some piece of geometry, or slightly miss the doorway I’m trying to back through. An inset rear-view mirror would be perfect. I think I would prefer it appearing by manual keystroke, rather than automatically when I reverse. Often you reverse a little for tactical reasons but have no desire to look behind you or go back very far… e.g. when there’s a wall close behind you anyway. In that case it would be annoying to have the rear-view inset popping up and obscuring your forward view. Anyway, I think this is a great idea. I’ve been making a 3D flying maze game (http://code.google.com/p/maze3dflyer/) and have been thinking that a rear-view “mirror” would be helpful sometimes in navigation. This sounds weird. Would feel like a car or something I think. well, what about a small mirror thats attached to the charecters shoulder as to make the concept a little more plausable? could work for games where your mainly roughin” it, not in the city. hmm I think mirrors attached to shoulders is a bit weird.